One M-61A1 20mm multibarrel cannon with 500 rounds; external stations can carry up to six air-to-air missiles, conventional air-to-air and air-to-surface munitions and electronic countermeasure pods. The F-16 flew more sorties in Operation Desert Storm than any other aircraft. 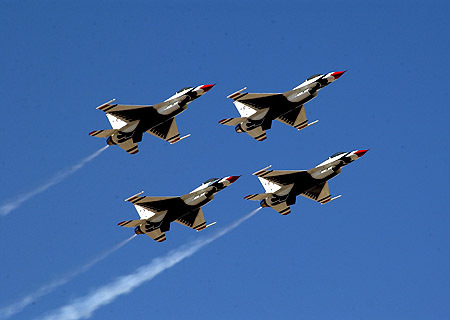 The F-16 is the most numerous fighter in the West. All F-16s delivered since November 1981 have built-in structural and wiring provisions and systems architecture that permit expansion of the multi-role flexibility to perform precision strike, night attack and beyond-visual-range interception missions. This improvement program led to the F-16C and F-16D aircraft, which are the single- and two-place counterparts to the F-16A/B, and incorporate the latest cockpit control and display technology. All active units and many Air National Guard and Air Force Reserve units have converted to the F-16C/D. Most recently in the Spring of 1999 during Operation Allied Force, USAF F-16 multi-mission fighters flew a variety of missions to include suppression of enemy air defense, offensive counter air, defensive counter air, close air support and forward air controller missions. Mission results were outstanding as these fighters destroyed radar sites, vehicles, tanks, MiG's and buildings.